How to view the Group Interface? The Office@Hand User Groups feature allows you to organize your users under a specific group to be managed by a single group manager. For more information about User Groups, go to Office@Hand: User Groups Overview. Note: You must be set up as a Group Manager to proceed. On the upper right corner, switch to the Admin Portal view. On the User list tab, click the user that you want to modify. You may now view and modify the user’s settings. 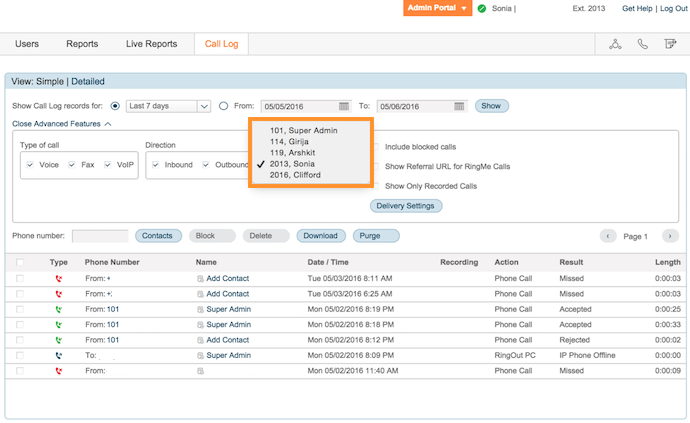 On the Admin Portal, click Call log. You may now view call logs of the members.